As one of two major Civic Center buildings put on the block in 2012 by the Bloomberg administration, sale of the Clock Tower Building, the two-block-long 1898 landmark at 346 Broadway, was opposed by Community Board 1. Badly needed school seats should have been part of the deal, they said. But the $160 million sale went through with the promise of a different amenity: a nearly 16,000-square-foot media center. Now, the board complains, they aren’t getting all of that, either. In a resolution passed late last month, the board is calling on the city to reject the developers’ modified proposal, which now splits the media center between two floors. And it offers only about two-thirds of the space that the board says the community was promised. A little less than 10,000 square feet of the 16,000 is usable, as it turns out. R. Donahue Peebles, whose Peebles Corp. along with the El Ad Group, are converting the 14-story building into condominium residences, explained the proposal to CB1’s Planning Committee last month. He insisted that his company is not backing down from that agreement. The alteration was made, he ex­plained, to satisfy the Landmarks Pres­ervation Commission’s request to make the grand former banking hall on the floor above a publicly accessible space, rather than the townhouses that the developer had wanted. To do that, Peebles said, an elevator-and-stair core has to be installed and the ground-floor community facility reconfigured. Ashley Thompson, from the mayor’s office, made it clear that any fault by the city rests with the previous mayor’s staff. But CB1 chair Catherine McVay Hughes was not satisfied, noting that the new plan reduces the amount of usable community space by 36 percent. The city chose the Tribeca-based documentary film center DCTV (Down­town Community Television Center) to run the media center, located two blocks from its home at 87 Lafayette St. Jon Alpert, co-founder and co-executive director of DCTV, said the reconfigured space will be be harder to attract funders. According to an agreement with the city, the developers are giving $2 million to DCTV to build out the space. But Alpert claims he needs $8 million to $10 million to do it right. As compensation for the less valuable space, the developer agreed, through negotiations with the city’s Economic De­velopment Corp., to give the city an additional $2.5 million. Those negotiations may continue, according to Jeffrey Nelson, the executive vice president of real estate transactions for the EDC. “There’s a question in our mind as to whether the $2.5 million is an appropriate compensation,” he said. “The additional $2.5 million will go a long way, whether it’s to finish building out the community facility space or, if you guys have any other ideas, we’re certainly all ears as well,” Thompson told the committee. The board’s resolution calls on the city to require the developers to stick to their original plan, and keep the community space on one floor. It also asks for an agreement with the developers that “restores the value of the community space” and asks for more than the $2.5 million in compensation, to be spent within Community Board 1. 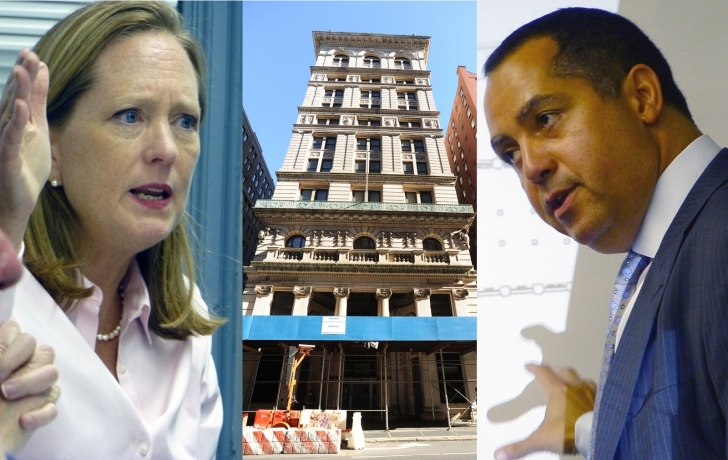 Peebles Corp. and El Ad Group must not only come to terms with the city over its compensation for the space, but they also need to win Landmarks Preservation Commission approval for its extensive restoration and conversion proposal, described on the next page. The developers and their architectural firm of Beyer Blinder Belle are scheduled to go before the commission on Nov. 18.